Nelson Soken, Barnes & Conti’s Chief Innovation Officer, wrote an article on investing in learning and development when focused attention is becoming scarce. Nelson argues that investing in learning and development delivers significant rewards to everyone in the workplace. He continues with eight principles and New Year’s resolutions for investing in learning and development. Read the entire article on our website. Follow this link to read the entire piece. Framing—or reframing—is a strategic tool which is useful to exercise influence and to manage change. 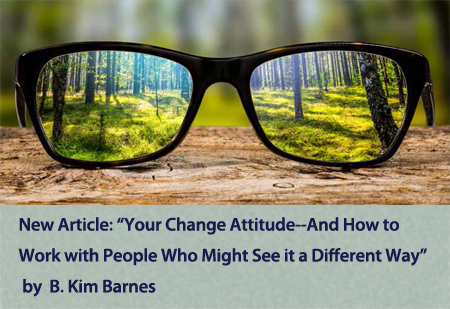 In this article, Kim Barnes discusses making what is considered new and potentially threatening into something both familiar and comfortable. So how can we use the understanding that people are comfortable with what they know and skeptical or even fearful of things that fall outside of their experience? As innovators and as influencers, we need to be willing to understand how others perceive the world. We need to find a way to locate our ideas on their map of reality.